As I was driving home from work the other day, I heard something on the radio that made me do a double-blink. I reached down for the dial and turned up the volume to the sweet strains of Tchaikovsky’s “The Dance of the Sugar Plum Fairy”. A few seconds later, an announcer came on to inform me that tickets for the Pacific Northwest Ballet’s Nutcracker are now on sale and going quickly…fall, my friends, has arrived, and the winter holidays are chasing along right behind it. Well, let’s just be honest. Isn’t fall just the awkward time between “Back To School” and Halloween? I walk through the aisles of the all-in-one grocery store, and between the Halloween decorations and the Christmas lights lies a three foot section of Thanksgiving decorations and tableware. I feel this is a pretty visible indicator of how quickly summer turns into winter with barely a pause in between. When I was a kid, it felt different to me. We went back to school (new notebooks and pencils STILL make my heart skip a beat!) , and then the conversations turned to what amazing Halloween costume we were going to get and how much candy we could acquire in a matter of hours. We mapped out our routes, discussed which houses historically had the best candy, and strategized how to mix-and-match our costumes halfway through the night so that we could hit the same houses twice. Halloween was THE thing. end, riding in his sleigh and waving to the crowd, it was as if he were granting permission for the winter holiday festivities to begin. I hereby protest this mowing over an entire season to get to the mad-crazy of consumerism known as the holiday season. There’s an entire month of opportunity in there, and a world of good eats that gets lost in the shuffle from Halloween candy to sugar cookie. There are so many missed opportunities to use the flavors of fall – the apples, pumpkins, squashes, nutmeg, cinnamon…so for this week’s recipe, I wanted to try to capture one of the traditional flavors of the season in a new and refreshing way: pumpkin. You think of pumpkin, and you instantly think of pie, that delicious blend of sweet and savory. This beautiful gourd is usually only captured in desserts and only rarely seen in a main dish, but today, we’re going to do just that. To start, we’ll begin with the gnocchi. 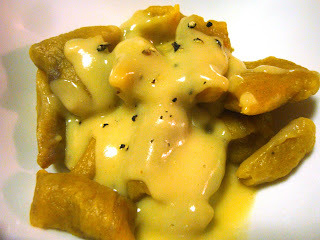 Now, gnocchi has always been sort of a favorite of mine, though I rarely can track it down. Traditionally made with potatoes, many of the store-bought brands are simply too flavorless and starchy for my taste. After scouting some recipes, I realized that the concept behind it is actually pretty simple, and I couldn’t understand why I’d been paying so much for it through the years. First, combine the pumpkin, salt, and seasonings in a bowl. I chose to use pumpkin spice, but if you don’t like one of those (allspice, ginger, cinnamon and nutmeg), simply mix-and-match until you find what you like. Or, get hectic and try something all together different! Sage, Thyme...who knows where you can take it. Gently form the dough into a long roll on a floured surface. As I discovered, this dough won’t roll like your child’s play-dough does (though it IS a pretty color). No, you actually have to shape the dough into a roll about ½ inch wide using what I seem to remember as my mud pie technique – just squeeze and shape with the palm of your hand. Now comes the fun part – deciding how big you want you gnocchi “pillows” to be! Me personally, I prefer them small, about ½ inch wide. It’s a texture thing. Others prefer the big “pillows” about an inch long. You decide – your meal, your call! this. However, for me and the roomie, it’s hardly necessary. Once your gnocchi are done, here’s a handy tip – lay and extra out on plates or sheets, cover them, and slip them into the freezer. Once frozen, divide them into individual servings and slip them into plastic zippie bags. You’ll have a quick, delicious homemade meal with very little prep later! Cooking your gnocchi is simple; just boil water and season it with a bit of sea salt. Once you’ve got a nice boil going, add several gnocchi to the water. Do this in small batches; you don’t want it to all stick together! In about three minutes (give or take), your gnocchi will rise to the surface, letting you know that it’s done. Simply scoop them out with a slotted spoon, drop them on a plate (careful not to let them touch or they’ll stick together) and they’re ready for their sauce. sauce and taking a different tact altogether; abandoning sweet for savory. I went closer to something I’d found online, using ginger. other posts, I’m a big fan of flavor, so I went all out on the seasonings. Pour the sauce gently over the gnocchi and voila! A delicious way to savor the season – the FALL season, that is! 1 can (15 oz) pumpkin. If in water, drain as thoroughly as possible. Be sure to come back next week for another kitchen adventure with Scarlett. Until then, stop by Confessions of a Shieldmaiden and say hello.